- Solar powered models for heating water and providing electricity. Also known as “Greening the Desert“, the project features a main educational center for permaculture design classes. The first class was conducted in October, 2009. Phase I (Sept., 2008) – all initial infrastructure was built, including the main house, fencing, garden set-up, compost toilet (dry), water tanks, reed bed (gravel), nursery, animal area and plant nursery. Phase II (March, 2009) – solar infrastructure installation, plant and animal systems set-up and completion of the main house (furnishing, interiors, kitchen, bedrooms, office). Phase III (March, 2010) – Completion of training programs for local trainers with mentorship from the main Permaculture research institute for management of the project (education, administration and infrastructure). The Permaculture Research Institute of Jordan aims to establish completely local operations with minimal visits from the mentoring staff. The institute also looks forward to extending the project to other Jordanian areas which might take an interest in establishing a similar system. This project needs permaculture course enrollees to take part in Permaculture Design Course (PDC)s to help establish a fund for maintaining operations. Click here for more information. 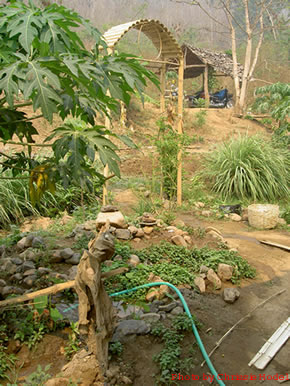 The Permaculture Design In Pai project is a co-operative of local and multi-national community members developing a 5.5 acre agricultural property along Pai River. The land belongs to Buti, an akha tribe woman and her family who have been working the land with their own traditional permacultural practices. Members of the farm grow nuts, incense and hardwood trees, among others. At present, the farm harvests sugar cane and sells it at its own store. There are future plans to do many more cottage industries. The co-operative community at Pai also plans to build a bio-gas digester, plant 400 peak trees and create alcohol fuel from fermentable harvest surplus. The farm is seeking willing workers on their organic farm as well as donations for several equipment and other things needed on the site.